This page tells you how to update the crowd.properties file in Confluence, if you are using the Windows Evaluation distribution of Confluence. Download 7-zip , a program that you can use to unzip a JAR file. 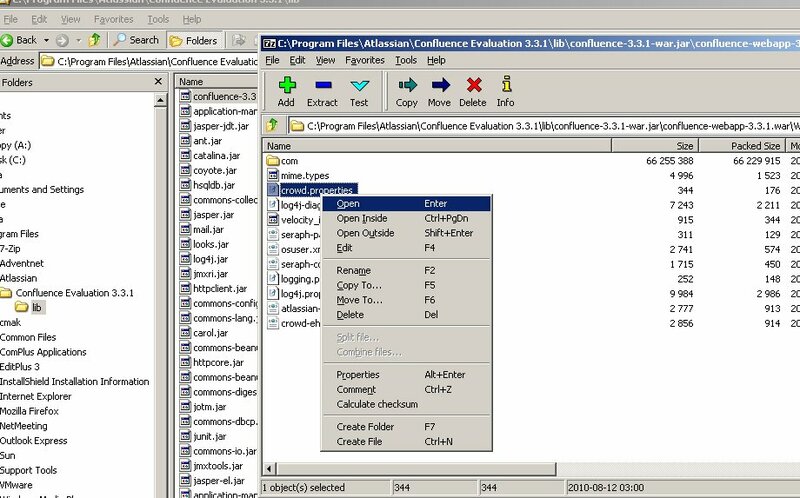 Navigate to your C:\Program Files\Atlassian\Confluence Evaluation 3.3.1\lib directory and open the confluence-3.3.1-war.jar file in 7zip. Navigate to the relevant ../WEB-INF/classes directory. Edit the crowd.properties file and save the changes to the zip archive.